Sandeep Joshi is the Founder Director of Credible Media Voices Pvt Ltd, a strategic communication/media advocacy organisation. Sandeep has 20-years of experience as a journalist, having worked in premier media organisations like The Hindu, Press Trust of India (PTI) and The Pioneer. He has vast experience in covering issues related to politics, social, development, business et al. 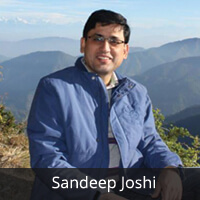 Sandeep also runs two news websites -- www.ICTFLASH.com & www.UttarakhandPanorama.com -- of which he is the Founder and Editor.